1554 Hayes Barton, near Buddleigh Salterton, Devon, England. 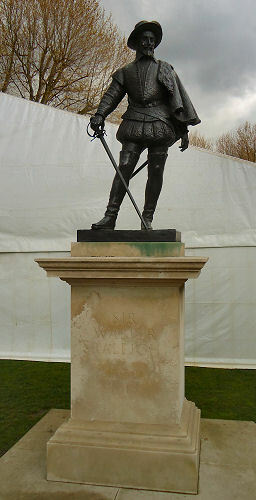 Walter Raleigh was the son of Walter Ralegh, a country gentleman from Fardell, near Plymouth. Oxford University. Middle Temple, London, to study law. 1578: Raleigh joined a piratical expedition against the Spanish organised by his half brother Sir Humphrey Gilbert. 1580: Walter Raleigh was sent to Ireland where he brutally put down an uprising. He later became a favourite of Queen Elizabeth the First and was showered with titles and gifts. 1584: He sent an expedition to America to take lands in the name of the Queen. 1585: He was appointed Lord Warden of the Stanneries and Vice Admiral of Devon and Cornwall. He also became a Member of Parliament for Devon. 1587: The Second Earl of Essex became Court favourite over Raleigh. and he went to Ireland and planted Estates in Munster and became a good friends with the poet Edmund Spenser. 1592: On his return to England Walter Raleigh was committed to the Tower of London for having a secret affair with Bessy Throckmorton, one of the Queens Maids of Honour. He was kept away from the Queen for four years. 1595: Raleigh took five ships on an expedition and explored the coasts of Trinidad and sailed up the Orinoco River in South America. 1596: With Charles Howard and the Earl of Essex Walter Raleigh sacked the port of Cadiz in Spain. 1600: Became Governor of Jersey. 1603: on 17th July although he had not taken part in the major plotting at the end of Queen Elizabeth’s reign he was still implicated and was arrested. He attempted suicide. At his trial at Winchester he defended himself but was condemned to death. Only on the scaffold was his sentence commuted to life imprisonment. 1616: Walter Raleigh was released from the Tower of London and went on another expedition to the Orinoco in search of a goldmine. The mission was a complete failure as many of his ships were sunk and his son died during the voyage. Breaking his terms of freedom he razed a Spanish town to the ground. 1618: On his return to England the Spanish Minister in London invoked the suspended death sentence. 1592 to Elizabeth (Bessy) Throckmorton, a Maid of Honour to Queen Elizabeth the First whom he had got pregnant. 29th October 1618, Whitehall, London, England. 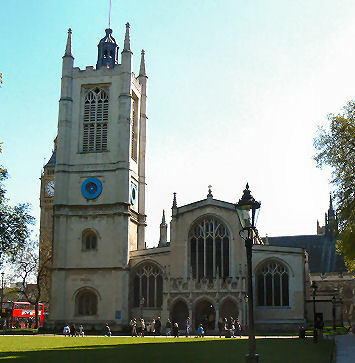 St. Margaret’s Church, Westminster, London. Coughton Court, Kings Coughton (Married Bessie Throckmorton).